Looking for a loose tile repair service company in Temecula, CA? Problem solved! 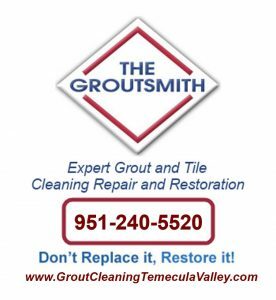 We’re The Groutsmith Temecula’s #1 grout and tile cleaning, repair and restoration experts. The Groutsmith in Temecula, CA is your cost-effective, professional loose tile repair company, with fully trained and certified specialists. We are proud to be Murrieta’s premier tile and grout cleaning, repair and restoration company. Fixing cracks in tile without replacing them. How-To Fix Loose & Hollow Tile Floors: Don’t Remove or Replace! Just Drill & Fill!